I guess this is kind of like an allergy friendly chicken picatta. I’ve recently learned (from a quick visit to wiki) that the picatta style of cooking means cutting the chicken breasts in half, then pounding them flat. Then frying and covering in a sauce. Kinda similar. I first made this for my mother who is gluten free, dairy free, soy free, nightshade free *meaning no potatoes, tomatoes, or peppers*, onion free, garlic free, and black pepper free – OMG something free of all of those things that actually has some flavor! Everytime I make it (which isn’t often enough) I can’t believe how easy it is, because there is literally only 2 minutes of prep. I also, everytime I make it, vow to start making it more often because it tastes so good! Preheat your oven to 375 degrees. 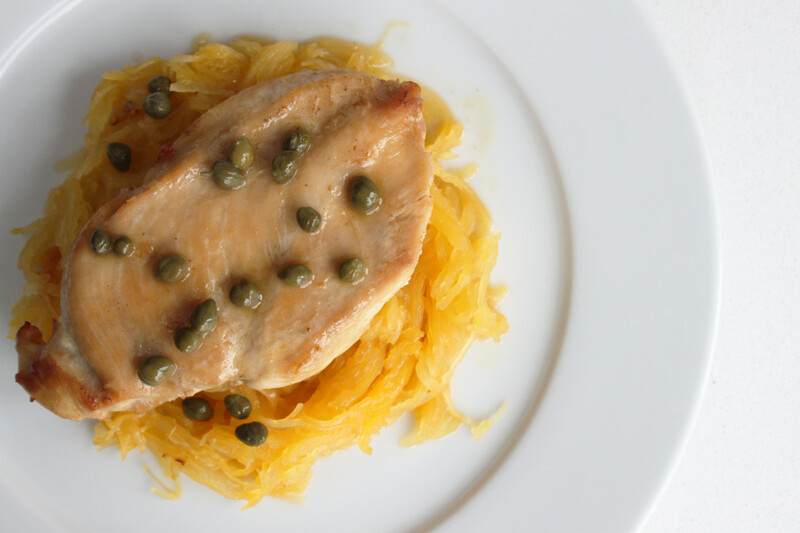 Rinse off the outside of your spaghetti squash. Place it in the oven and roast for about 1 1/2 hours, turning over half way through. When there's about a half hour left on your spaghetti squash, get going on the chicken. Place your chicken breasts into a gallon size zip lock bag (this is my favorite way) or between 2 pieces of wax paper and pound until they are about a half inch thick all around. In a skillet, heat 3 tbsp of avocado oil over medium high heat. Season chicken breasts with salt and pepper, then place in skillet and let brown for 3 minutes of each side (you may have to do only 1 or 2 chicken breasts at a time). Each side of the chicken breasts should get nice and browned (watch to make sure they don't burn). After all of the chicken has been browned, move the breasts to a glass baking dish and pop into the oven for an additional 7 to 10 minutes (depending on how thick your chicken is). Deglaze the pan with your white wine, making sure to scrape up all browned bits. 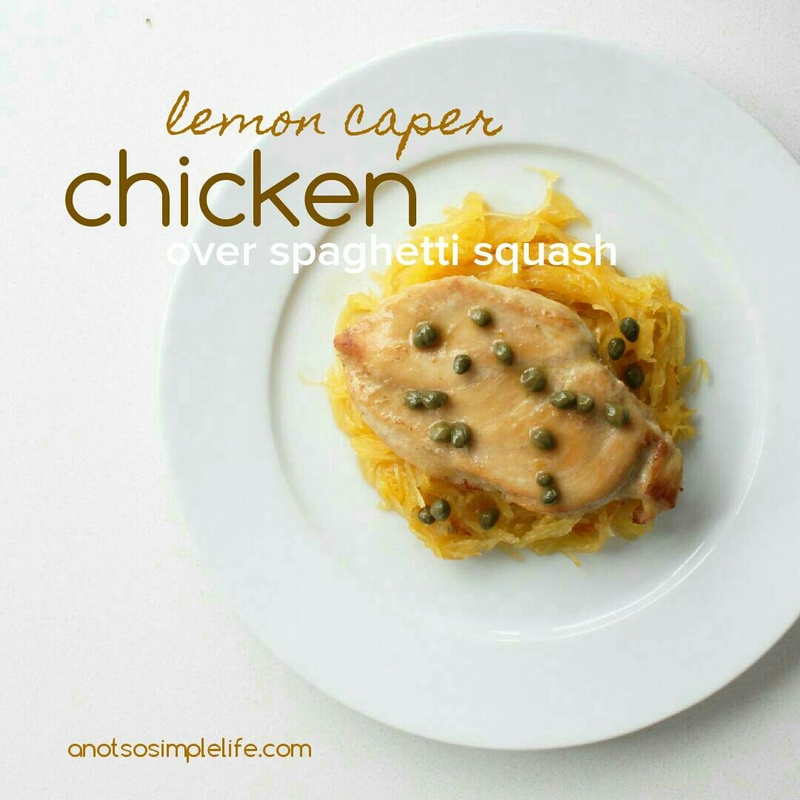 Add your butter (or butter flavored substitute), capers, and the juice of 1/2 lemon. When the squash is done, cut it in half (careful, it'll be hot!) - I like to cut it in half lengthwise (cutting in half with the stem at the top) because it leaves longer strings. Remove the seeds (you can save them and roast them if you'd like, follow my directions here and shred the spagheti squash shreds with a fork. 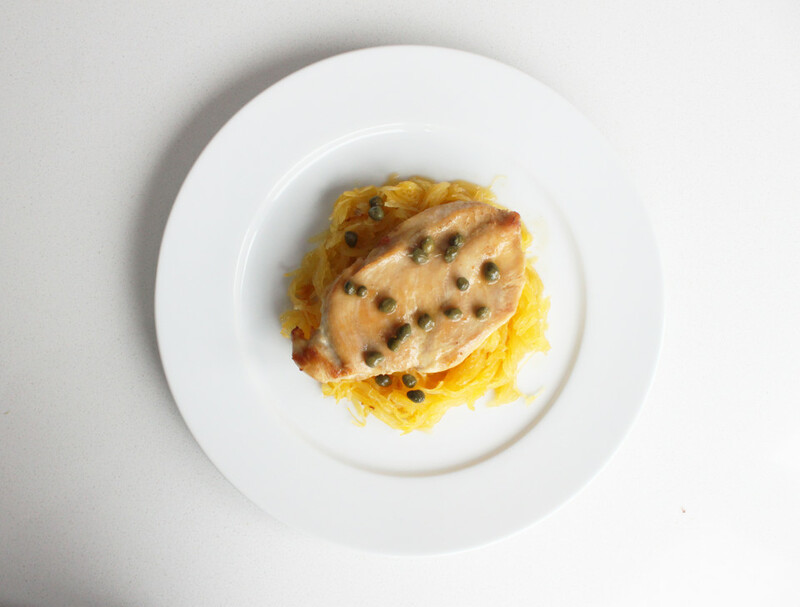 Serve chicken breast on top of the squash, drizzled with lemon caper sauce.